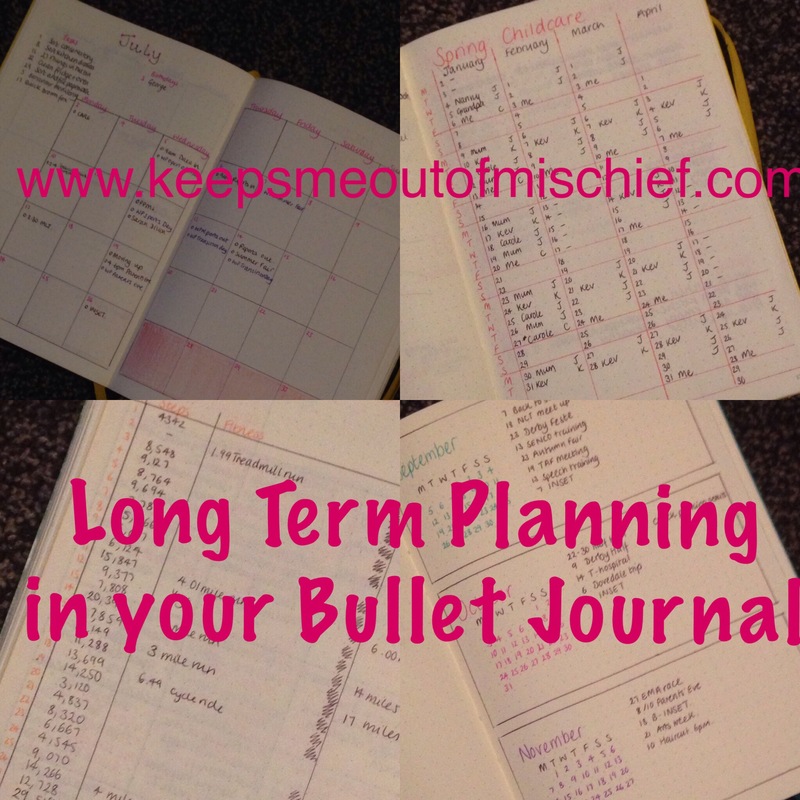 Long Term Planning in your Bullet Journal | Keeps Me Out Of Mischief! What’s working for you? Why? What’s not working for you? Why? How have you tweaked your system so it works better for you? Is there any way you could adjust your system so it works for you? One of the main areas that I struggled with when only using daily lists was the way I could record future events in one place so that it was easy to refer to as I went along. 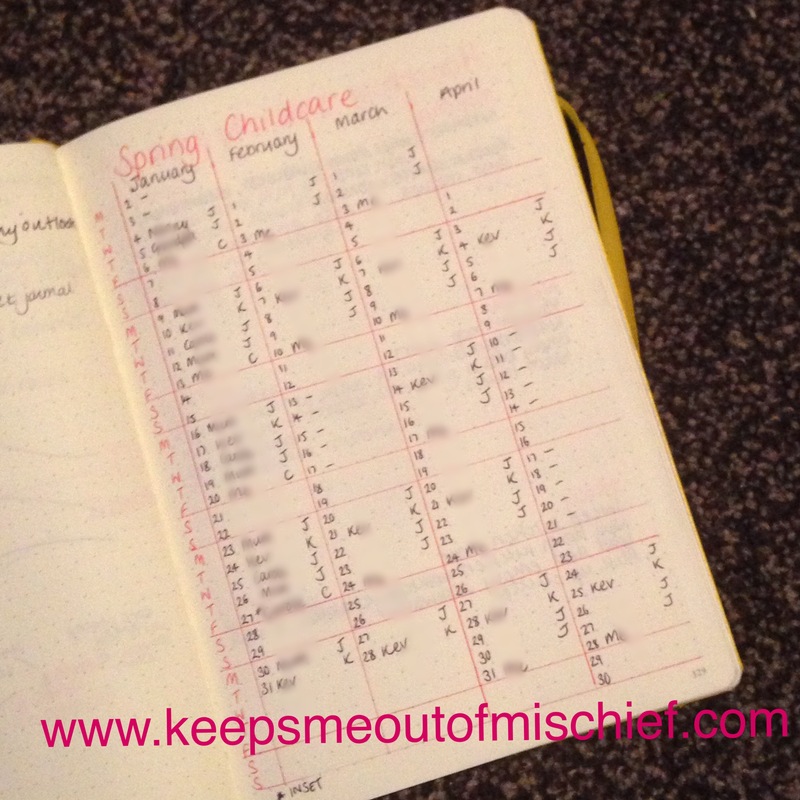 I need to be able to make appointments/ plan events up to a year in advance so I needed a system that worked for me. Do you have a lot of events to record, or only a few each month? How far ahead do you need to plan? 1 month? 3 months? A whole year? Do you like to see dates shown as a list or in more of a traditional calendar format? A traditional calendar format. This has the benefit of having a little more space than the others shown below. You can record a number of events each day and you can see which day the date falls on. A number of these, right through the year if necessary, could be drawn in a block in your Bullet Journal. As a teacher, I draw out the rest of the academic year at the front each time I start a new journal so that I can easily refer to it as my journal progresses. A few months to a page with the days and dates listed. This might be more useful if you only have one or two events each day or want to record something like a work rota. I use one like this for my childcare arrangements each term at school. A few months to a page with monthly calendars allowing you to see on which day of the week a date will fall and giving you space to list events. 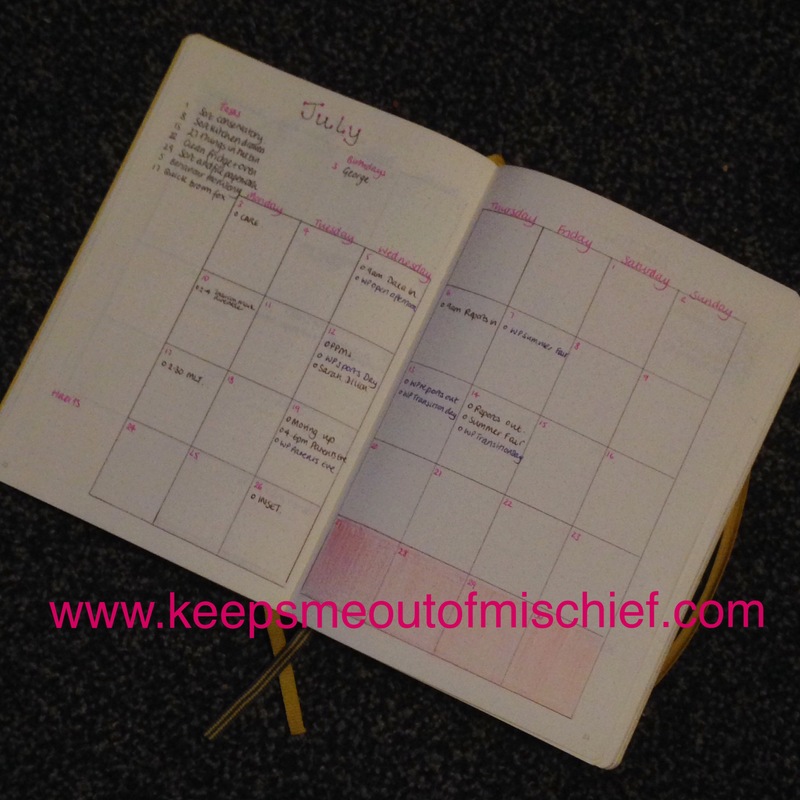 I use this towards the end of an academic year to show the first few months of the new year, allowing me to record events ready to transfer into my new journal. It doesn’t matter that the dates aren’t in the correct order, you just add them as you become aware of them. A month log. This is a cross between the first two. It gives you more space to record events for the day. 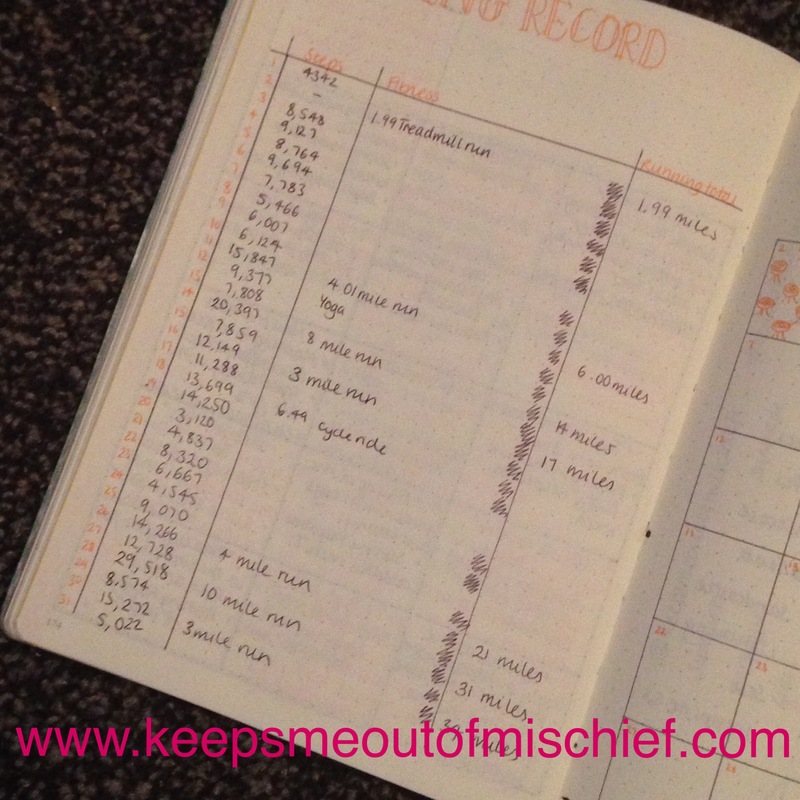 I don’t use one to plan for the future, instead I have used it to record my daily step total and my fitness record. You could use it to plan a fitness schedule. Which one are you drawn to? One will probably stand out as something that will work for you. Set one up now ready for February and see if it’s useful to you and if it provides you with the right amount of space necessary for your needs. You’ll be able to adapt it as you go along, that’s the beauty of a Bullet Journal! Since we’re almost a month in to your Bullet Journal trial, you’re probably getting a good idea by now if this is a system that could work for you. Up until now you may have been using a notebook that you’d found at home. If this notebook is working for you, then keep going! If you’ve been looking at Instagram or Pinterest and have been lusting after a Leuchtturm 1917 or a Moleskin then you might want to treat yourself, but don’t feel that you have to! Think carefully about the size that you might want to buy, you won’t carry around something that’s too heavy and you won’t have room to record all that you need if it’s too small. While we’re talking about looking at Bullet Journals on social media, I’d like to issue a small health warning. By all means look at the lovely pictures, be inspired by them, but don’t judge your journal against them. 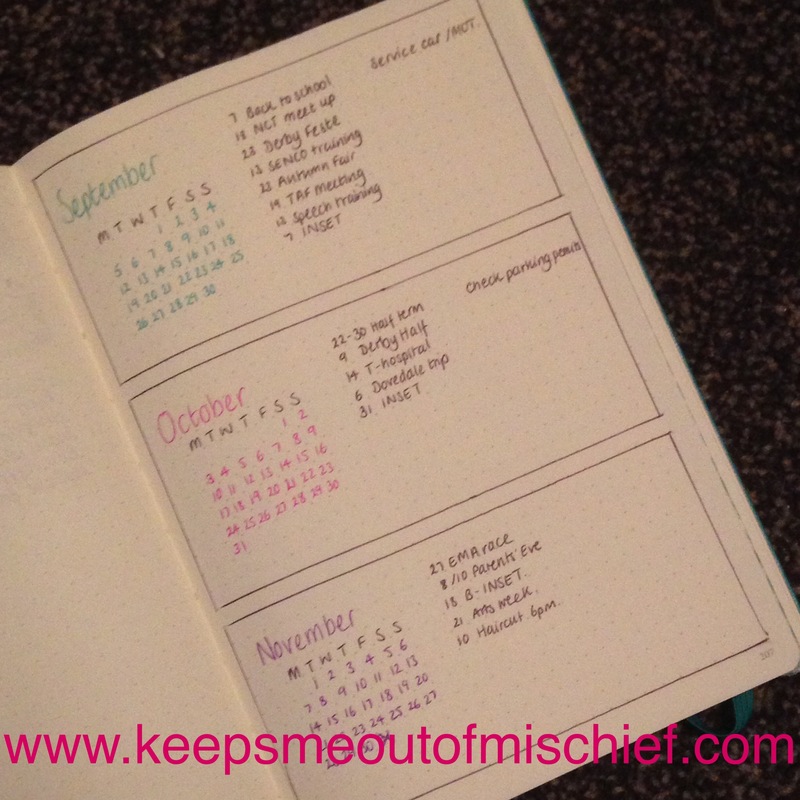 You need a journal that works for you and helps you to be more organised and productive. If you consider creating beautiful spreads is a good use of your time and energy then go with it, but if practicality and getting things done is more useful to you then don’t beat yourself up over it! Be inspired by my Instagram and Pinterest feeds, but remember to adapt ideas to suit your needs. Pingback: Using a Tracker for Repeating Tasks | Keeps Me Out Of Mischief!